Test drive a $300,000 super-car on 25-miles of scenic canyon lands outside of Golden, Colorado. With a good mix of canyon turns and straightaway valley driving this gives you the best of both worlds without breaking the bank. You will also have the opportunity to take your photos in the mountains. This is a guided small-group ride while getting a taste of the good life on this introductory luxury car tour. The maximum participants for this ride is 6. 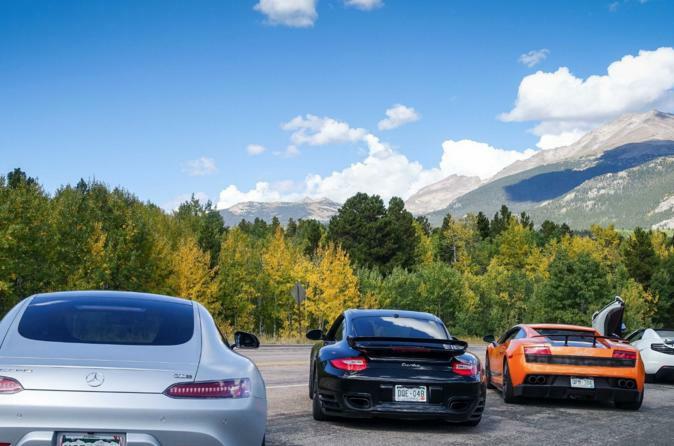 The roads outside of Golden, Colorado offer some of the most scenic driving in North America. Nestled below the foothills of the Front range in the Colorado Rocky Mountains, the town offers spectacular vistas, crystal clear streams and twisting canyons. With the help of an ultra-luxury, premium super-car, cruising through hair-pin turns and high elevation straightaways becomes a heart-thumping adventure for the brave of heart. The tour starts in Golden, Colorado, a true western mountain town that got its start during the Colorado Gold Rush. After a short informational and safety orientation, you will take the wheel behind a premium racing car like a Lamborghini Gallardo Spyder or Porsche 911 Turbo. This tour is meant to simulate the experience of a dealership test drive, meant to pull you out of your comfort zone and let you get a feel for the incredible responsiveness and unreal acceleration of a professional-grade racing car that few drivers get to experience. The 25-mile route will take you on over 200 twisting turns and thousands of feet of elevation change while providing open straightaways meant to test the capabilities of these high-performance vehicles.